LASIK Archives - Moran Eye Associates, P.C. To help maintain your great vision after LASIK, the use of eye drops is key. A patient recently shared a smartphone alarm app with us that reminds you to use your eye drops regularly! LASIK surgery is a high-tech procedure that improves your vision in about 20 minutes. The laser application itself takes just seconds. But LASIK is much more than just a quick LASER treatment to the eye. Pre-Operatively, there are multiple exams, measurements, interviews, and calculations. The Post-Operative period is also important to a successful, stable outcome. We consider the postoperative period to be ONE YEAR. During this year, Dr. Moran highly recommends that patients use a rigorous schedule of artificial tears. Patients who follow this post-op protocol, do better, heal faster, and have less chance of their vision changing for the worse. Remembering to take your drops the first week is easy. Seeing without glasses or contacts is an amazing change. Patients are enthusiastic and stay on top of their drop schedule. As more time passes, patients may not think about their new vision as much. Although the newness of the better vision wears off, the need for drops doesn’t! Studies have shone that your eyes may need supplemental moisture for more than three months after the surgery. Even though the eyes don’t feel dry, they need the added moisture to maintain quality tear film and to provide the best visual result. A patient recently showed us an iPhone app he downloaded (iPhone only at this point, sorry Android users.) The app is free for download, well written, easy to use and comprehensive. The full description can be found at http://www.eyedropalarm.com/ The app is free and requires no login or personal information. It has a full database of eye drops, even those used for other eye problems like glaucoma. The features are useful and extensive. As seen in the illustration, this app also indicates if the drops need any special instructions, for example, the FML should be shaken before use. Using multiple drops requires you to wait five minutes between each different drop so that the eye can absorb each medicine…the app automatically schedules each drop 5 minutes apart! If you have an iPhone and have to take drops, we highly recommend EyeDropAlarm. You can download the app by scanning this QR code or through iTunes. Is $299 LASIK a Real Deal? I’ve been doing LASIK surgery since the turn of this century, so I keep up on LASIK news. I hadn’t seen deeply discounted LASIK at unbelievable prices in quite a while. But recently, I have started to get emails offering me LASIK at $299 per eye. As a physician practicing in today’s environment, I have a responsibility to ensure my patients are getting a fair price. When an EpiPen can cost $500, and drug prices can increase from $7.50 to $750 overnight, I must make sure that I consider price options when making recommendations for my patients. In the past, knowing what it costs to operate a LASER and the cost of performing a safe and accurate LASIK procedure, it was evident that there weren’t many LASIK surgeries being performed at the advertised price of $299. It costs far more than $299 for the doctor to perform LASIK, not to mention the equipment costs for accurate testing and measurements. Recently I got an email offer which finally included the “fine print.” I’m going to break it down. Then the other shoe drops. 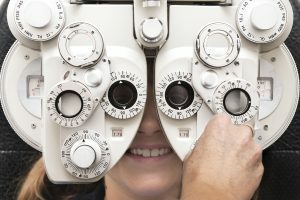 If you have a half of diopter of astigmatism that raises the price to $1799, which is now approaching a reasonable price for a standard LASIK procedure. Seventy percent of all prescriptions written in America have some astigmatism. Which means if there if there is a significant enough prescription that needs correction and one is given, three-quarters of the time it’s going to have astigmatism. The price has now hit the $1800 per eye mark. I got a chuckle from this portion of the disclaimer. Pretty obvious observation. And then there’s the “additional cost” disclaimer. So even with the maximum quoted price of $1799 there are still add-on charges to consider. The take-home message: you’re not likely to get LASIK (or do you need LASIK) at $299. There may be small variations in price for LASIK surgery by area doctors, but the costs for procedure tend to be similar. If you have dry eye, you are not alone. Dry eye is one of the most commonly reported eye complaints. Dry eye is a chronic medical problem that may get worse over time. We now offer in-office heat therapy treatments that target the cause of dry eye, and help preserve a healthy tear system. Dry Eye Symptoms: Along with pain, sandy or gritty feeling, and redness, dry eye can cause eye fatigue and blurred vision. It can also cause difficulty in reading or working on a computer. These symptoms can impact your daily activities. If you have any of these symptoms but artificial tears aren’t providing relief, it may be time for heat therapy. 15-Minute Heat Therapy Treatments Now Available in our Office: Moran Eye Associates is now offering a safe, in-office, FDA-approved heat therapy. Dr. Moran recommends starting with four 15-minute weekly treatments to help improve the quality of your tear film. Here’s How Heat Therapy Works: Heat therapy targets one of the major causes of dry eye, Meibomian Gland Dysfunction (MGD). The meibomian glands, which are located in your upper and lower eyelids, provide an essential part of your tear film, lipids (oils). If these glands are blocked, the quality of your tear film suffers. Without these oils, tears evaporate too quickly. How Do I Get Started? Schedule your appointment for a tear film evaluation to see if this treatment is right for you. Once Dr. Moran confirms the diagnosis of the Dry Eye Syndrome/MGD, you can start treatment right away. Call to schedule your evaluation appointment 610-628-2022. Pricing: $53 for the 1st Treatment. For optimal results, Dr. Moran recommends starting your therapy with weekly treatments. P.S. Dr. Moran and our entire staff have used this heat therapy treatment and are impressed with our results! At Moran Eye Associates, patient education is a priority. Our goal is to make sure that you see clearly AND that you understand clearly as well! Have you ever left a doctor’s office and not been completely sure about your diagnosis or treatment plan? We never want that to happen to you at our office! Dr. Moran is an expert at making complex medical information easy to understand by using analogies. We’ve compiled a “Best of” collection here. Our patients appreciate how he explains the sometimes confusing issues of eye care! Our patients appreciate how Dr. Moran explains the sometimes confusing issues of eye care! If you want to see what’s on the other side of a fence, the bigger the fence hole, the more you can see. When patients ask why they have to be dilated, this answer helps make it easier to understand. If Dr. Moran is looking through your normal pupil he/she will only see a small portion of the back of the eye. If he is looking through a dilated pupil, the hole is much bigger, and he can see much more to better evaluate the health of your eye. Your eye is like a camera. The retina is like the film of the camera, and the eye’s lens is like the lens of the camera. In order to have good photos (clear vision), both the lens and the retina must be working well. You won’t have a good photo is there is a problem with the film…just like you won’t have a good photo if the lens is damaged. Tear film is like rain on a windshield. If it is only drizzling and there is very little rain (poor tear film), your windshield will be streaky, the wipers won’t work effectively, and your vision will be blurry. If it is raining steadily (good tear film), the wipers will clear away the water effectively and your vision will be clearer. Your eye works the same way…good tear film is needed for clear vision. You don’t need a bazooka to swat a mosquito. When Dr. Moran prescribes medicine, he chooses the right medicine for your needs. There are many options available, so it’s important to have the right dosage of the right medicine, more is not always better! Changing treatment plans is like turning a cruise ship, turn gradually and you will get you where you need to go smoothly. If you are moving from one treatment plan to another, we don’t want to make abrupt changes. Making gradual changes can help to achieve the best results. When you put out a fire, make sure it is out completely. If you leave embers burning, it may reignite! It’s a good way to understand why you need to continue taking all of your medicine. If you stop taking it before the pain is gone, or before the infection is completely gone, your problem could start up again. Think of it like a fire that reduced to embers, it can burst into flames again! Dr. Moran is always coming up with new and different analogies to make vision care less confusing. We’ll continue to update our “best of lists” on Facebook and Twitter! “Like” & “Follow” Moran Eye Associates us to stay informed!